Here's what distinguishes Ramin Bahrani's films for me, and why I like them so much. When I watch a movie by director of "Man Push Cart," "Chop Shop" and "Goodbye Solo" (which just won the FIPRESCI critics prize at the Venice Film Festival), I don't feel somebody has begun with a pre-set story and then figured out how to film it. I feel like I'm watching something that is rooted in concrete observation, inquiry, exploration. It feels as though the filmmaker has noticed something that has moved him or roused his curiosity, and that he has decided not just to incorporate those things into his movie, but to actually focus on them and see where they they took him from there. "Goodbye Solo," for example, doesn't just use Bahrani's hometown of Winston-Salem, North Carolina, as local-color backdrop. The movie feels like it's living there, and has been for some time. It's not just visiting. 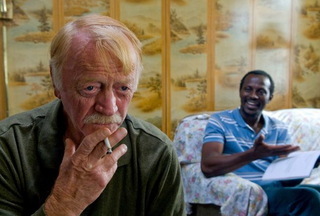 The two central characters -- a young Sudanese taxi driver nicknamed Solo (Soulémane Sy Savané) and a crusty white Southerner named William (Red West) -- don't seem to have been cast but discovered. And to some extent that is true, of the people on whom the characters are based as well as the actors themselves. Both Solo and William grew out of people Bahrani encountered, one way or another, in Winston-Salem. Savané is a first-time actor, with experience as a model and an Air Afrique flight attendant; West is a veteran stuntman and member of Elvis's Memphis Mafia. Both men possess what I like to think of as landscape faces, and every shift in the story of their relationship is reflected in those faces. Rest assured there is nothing cute or conventionally "heartwarming" about this pairing. The most striking contrast between the two men is one of outlook: Solo, perhaps due in part to his African-immigrant background, has a young man's determination and optimism. William, at age 70, sees no future but death. Able only look back in regret, he offers Solo $1,000 to take him up to a cliff called Blowing Rock in two weeks' time. It's clear to Solo what the old man intends to do, and he resolves to befriend William, in hopes of dissuading him from making that final leap off the precipice known as Blowing Rock. It is apparent from the first image -- a two-shot of Solo in the front seat of his cab with William sitting in the back -- that this film will be not only a tug-of-wills between the two men, but a story about limits, and how far one person can insinuate himself into the world of another. By the time the movie reaches its climax, in the gentle fog of Blowing Rock, these two characters face each other across a yawning void, and it's the words unspoken that echo most resonantly through the landscape. An American Carol: Anybody seen it?